On 15th June 1919, Lieutenant Arthur Whitten Brown (Navigator) and Captain John Alcock (Pilot) became the first two aviators in history to fly the atlantic in a Vickers Vimy Biplane bomber. 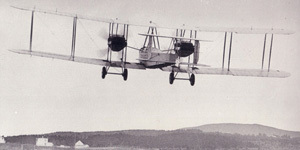 The flight took 16 hours 12 minutes to fly the 1900 miles from St John's, Newfoundland to Galway, Ireland. They landed on what had looked like firm ground near the Marconi telegraphy station near Clifden. 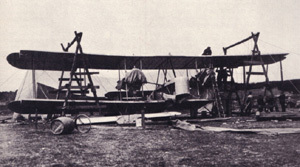 However, the ground was bogland and the aircraft crashed, but both Alcock and Brown survived the crash. 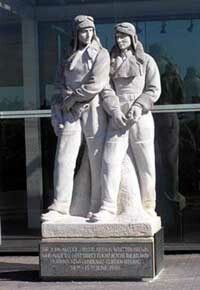 The two aviators won the Daily Mail Prize of £10,000 for achieving the first transatlantic flight and their aircraft is now preserved in the Science Museum in London. As a result of their exemplary achievement, both Alcock and Brown were knighted, but sadly Alcock died in a flying accident the same year. 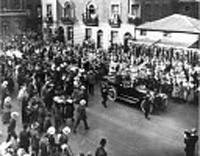 Sir Arthur Whitten Brown returned home to Swansea where he died on October 4th 1948. Sir Arthur Whitten Brown was the first Commanding Officer of the Squadron, an honour which inspires the Cadets and Staff to strive for new challenges and new standards within the Air Training Corps and the Community of South Wales. The Squadron Motto, 'The Way Ahead' was founded by Sir Arthur Whitten Brown and clearly describes his vision of dedication and commitment to achieving the highest standards possible. Translated into Welsh the motto reads, 'Y Ffordd Ymlaen', which is now depicted on the Squadron Crest. its epic journey to Ireland. 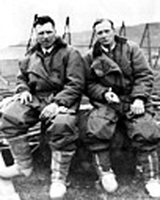 Alcock and Brown pictured in their flying suits after their transatlantic flight.